Semi-professional photographers are the ones who use their cameras to make money, but do not require the endurance of a camera like the professionals. The facilities, reliability, and durability of their cameras do not need to be as powerful as professional cameras. Semi-professionals in example are wedding photographers who mostly wear their cameras on weekends. For the semi-pro who need a camera reference especially Nikon, here will be reviewed further about the comparison of semi-pro camera between Nikon D750 vs D7100. Check this out. The D7100 marks an exciting advancement in image quality for high-resolution DX-format cameras. Nikon specially designed its 24.1-megapixel DX-format CMOS sensor without using an optical low pass filter (OLPF), resulting in the purest, sharpest images using D7100’s DX-format CMOS sensor. The D7100 makes it easy to share your great photos immediately, wherever you are. Connect the optional WU-1a Wireless Mobile Adapter and instantly transfer shots to a compatible smartphone or tablet, then upload them to the web, send by email or text and share them however you like. With Nikon’s free Wireless Mobile Utility installed on your smartphone or tablet (available for both Android and iOS), you can also remotely control the D7100. Use your phone or tablet as a Live View monitor to take shots without having the camera in your hands, a huge advantage for everything from self portraits to digiscoping with a Nikon fieldscope. Both cameras have 24.0MP sensors but Nikon D750’s sensor is Full frame sized whereas Nikon D7100 has a APS-C sensor. Weight is also another important factor especially when deciding on a camera that you want to carry with you all day. Nikon D7100 is 75g lighter than the Nikon D750 but we don’t think this will make a significant difference. Nikon D750 has a 2.4x Larger sensor area than Nikon D7100. Larger sensors give photographer more control on the depth of field and blurry background compared to smaller sensor when shot in same focal length and aperture. 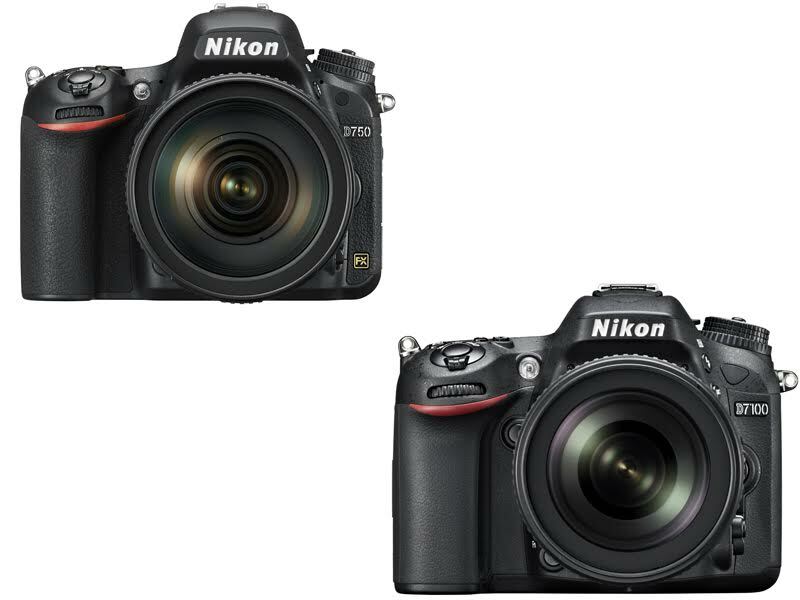 Nikon D750 is the winner of this overall comparison.